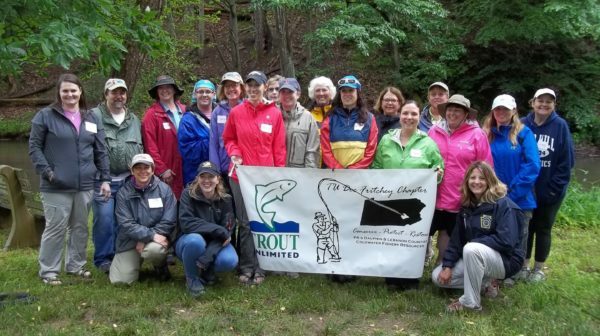 On July 12, 2011, the Doc Fritchey Chapter conducted its inaugural Women’s Fly Fishing Day at Ed & Nichole O’Gorman’s property along Clarks Creek. 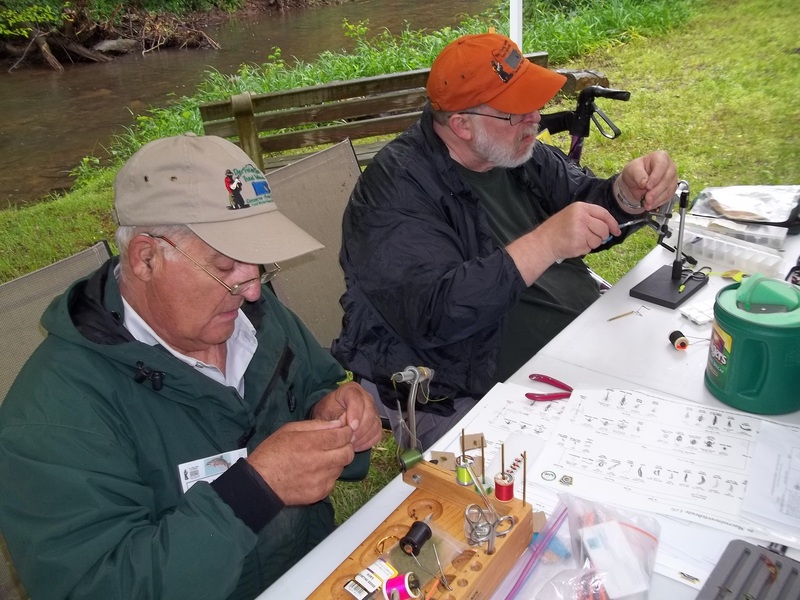 But just as the previous day’s high waters were receding to a fishable level, the heavens opened up during the afternoon and dumped enough rain to cause the stream to be unfishable. Fortunately, the O’Gormans’ pond saved the day for the group of about a dozen women to hone their fly fishing skills on the plentiful bluegill population, with a few nice bass thrown in for good measure. It wasn’t until June 10, 2018 that we reconstituted the Women’s Fly Fishing Day at the O’Gormans’ property, and you guessed it…rain once again greeted the 14 women who showed up for an introduction to the basics of fly fishing. Membership Chair Chuck Swanderski who organized this event led off with introductions, followed by breakout sessions to learn the various elements of fly fishing. 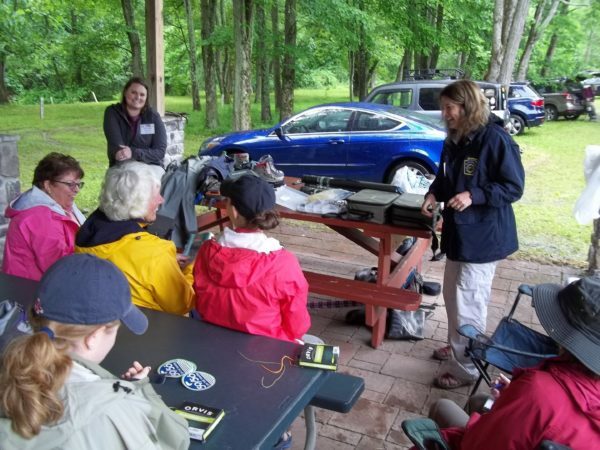 Amidea Daniel of the PA Fish & Boat Commission and Amy Coen of the TCO Fly Shop in Boiling Springs covered tackle and gear selection, as well as basic knot tying and tackle setup. A second station was manned by Lynn Langer who displayed a tray of macroinvertebrates while Steve Long and Joe Notarangelo demonstrated fly tying techniques and how the imitations related to the critters in the tray. 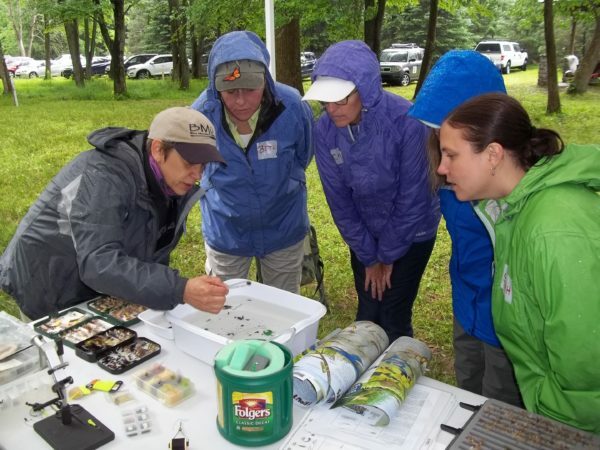 Rich DiStanislao conducted the fly casting instruction, at times under some pretty showery conditions. 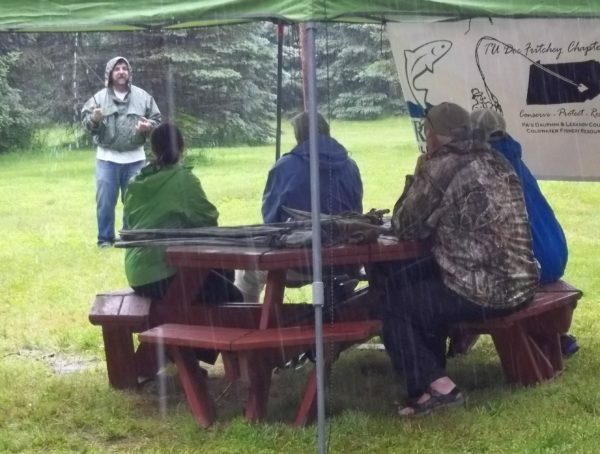 After the rain finally stopped in mid-afternoon, chapter volunteers were on hand to guide those women who were interested in utilizing their newly acquired skills on the stream. All in all, it was felt by all who participated to be a very productive, fun day.